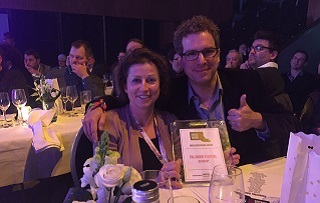 Yesterday evening (wed 13th of January 2016) the Green Operations Award 2015 winner was revealed at the Festival Awards Europe 2015 ceremony at Eurosonic Noorderslag in Groningen. The award jury choose the winner and it is TOLLWOOD FESTIVAL (GER). Congratulations! thanks alot for letting me present this award. And thanks a lot from GO Group. We are very grateful and honoured to once again be a part of the European Festival Awards s by hosting this category. All of these would make worthy winners. Congratulations to all of them! The one fetival the jury chose as this year’s winner stands for an overall outstanding approach on sustainability – economically, environmentally and socially. The festival’s green performance is exceptional and still they improve it year by year. …and especially last year’s focus on refugee care in their city and area. Practically, financially and by making it a main topic at their 2015 edition. …especially for those in need! Find out more about the underlying idea for the Green Operations Award here. More information about the other European Festival Award winners here.